Until recently, there weren’t any platforms in the UK where you could dollar-cost average into bitcoin (BTC). You had to do everything manually if you wanted to make regular bitcoin purchases. But that’s changing. A handful of platforms now allow you to setup recurring bitcoin purchases as a UK resident. In this post, we’ll outline the benefits and drawbacks of dollar-cost averaging and your options in the UK. Dollar-cost averaging (DCA) is where you setup a recurring investment of a fixed amount into something (like stocks), regardless of the market’s performance. The frequency (e.g., weekly, bi-monthly, monthly) of this doesn’t matter as much as sticking with the strategy – regardless of how the market is performing. It’s easier for many people to commit a small slice of their paycheck, rather than a lump-sum. You can make purchases on auto-pilot. Once you’re setup, you could just ignore market conditions and focus on other things. It reduces the impact of market volatility. If you automatically buy a slice at the wrong moment, it won’t drastically impact your average purchase price. If you can competently select the bottom of the market, then dollar-cost averaging won’t outperform lump-sum purchases. When you dollar-cost average, you’ll be buying at the bottom of the market (which decreases your average purchase price), but also at the top (which increases your average purchase price). This minimises your downside risk but can significantly curb your upside too. That’s because it dampens the impact of buying at the wrong and right moments. But while dollar-cost averaging doesn’t beat an optimum lump-sum purchase, it’s still a solid strategy recommended and used by many. Vimba (previously MyCryptoSaver) is a New Zealand based platform (established 2014) which allows you to automatically buy bitcoin (BTC) and ether (ETH) every week, every two weeks, or every month. Until recently, they’ve only operated in New Zealand. However, they’ve been testing their platform with about 30 UK users since March 2018. 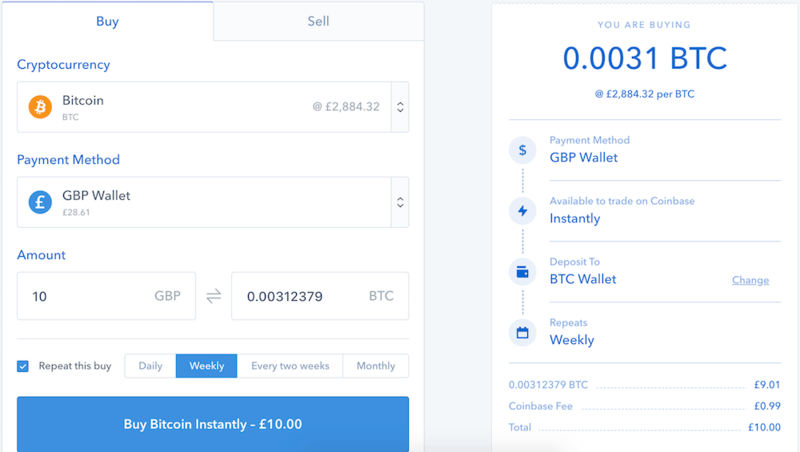 From what UK testers have reported, it makes automatically buying bitcoin (BTC) in the UK (with GBP) simple and easy. Once you’re registered and verified, you’ll be given payment details (incl. a reference number). Setup a standing order to Vimba’s UK bank account. Use the provided account number and sort code. Copy the reference number into the reference field. Set payment for every Sunday/Monday. On Monday, Vimba makes a bulk purchase with all the payments they receive. On Friday, Vimba sends the bitcoin to your specified wallet. You’ll receive an SMS when this happens. You can buy up to £2000 worth of bitcoin (BTC) or ether (ETH) per month. The minimum payment is £10 per week and they charge a fixed fee of 3.5%. Vimba is now officially available in the UK. Signup through this link and receive an extra £5 when you make your first transaction. After being granted an e-money license by the UK’s Financial Conduct Authority (FCA) in March 2018, Coinbase rolled out GBP payment support for UK residents. At the same time, they’ve re-introduced their ‘regular buy’ function. This allows you to buy bitcoin (BTC) and a growing number of other cryptocurrencies at regular intervals (daily, weekly, every two weeks, and monthly). It’s simple and easy to setup. Sign up on Coinbase (you’ll need to verify your identity). Fund your GBP wallet with a UK bank transfer. Select desired cryptocurrency (e.g., bitcoin). Insert the desired purchase amount. Check the ‘Repeat this buy’ box. Coinbase can’t automatically pull funds from your UK bank account. This isn’t much of a problem. It just means you’ll have to setup a standing order to Coinbase to cover the value of your regular purchases. Alternatively, just periodically top-up your GBP Wallet balance. For Coinbase’s best rates (1.49%), you’ll have to setup a regular purchase of at least £200. If you’re regularly buying less than that, you could be charged somewhere between 3% and 10% in fees. There are some more details from Coinbase here. To save you the trouble, we’ve parsed the percentage fees charged by Coinbase from £10 to £200 in this spreadsheet. Want to learn more about Coinbase? Check out our Coinbase review. I’m not a fan of Revolut’s in-app cryptocurrency support. Unlike MyCryptoSaver or Coinbase, Revolut doesn’t let you withdraw or deposit cryptocurrency into their app. That’s why they’ve never been added to BittyBot’s price comparison. Nonetheless, I thought I’d mention their ‘Vaults’ feature. This rounds up any purchases you make with your Revolut card and puts the difference into a vault. Anything which goes into the vault won’t be usable until it’s withdrawn back to your main Revolut account. Essentially, it’s the modern-day equivalent of a piggy bank. 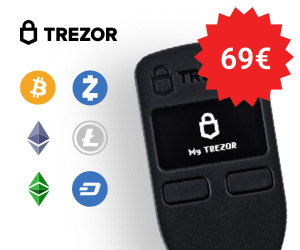 But instead of throwing pennies into this, you can opt to auto-convert this spare change into bitcoin (BTC), ether (ETH), litecoin (LTC), bitcoin cash (BCH), and ripple (XRP). You can also setup automatic transfers (every day, every week, or every month) into these vaults. When I tested this out, it didn’t have a problem setting up a regular deposit of £0.1 (in BTC) every day. Fees are hidden in the exchange rate (a fixed rate of about 1.5%). Of the options available, Vimba is our favourite. They support small purchases (min. £10), but without the crazy fees (fixed at 3.5%). For comparison, Coinbase charges more than 5% in fees when you buy less than £65. Your bitcoin (BTC) or ether (ETH) is delivered directly to your wallet of choice. You can easily adjust (one-off increase or decrease) or cancel your regular purchase. They will add support for more cryptocurrencies in the future (but they’ll be selective about which coins they will support). However, it’s cheaper to setup a regular purchase with Coinbase if you’re planning to buy more than £100. What do you think? Are there other options we should check out? Posted in Features, Merchants and tagged coinbase, dollar-cost averaging, recurring transactions, regular purchases, revolut, vimba.